Beleaf Melanin is an example of the reality that hard work, patience, and dedication to improving your craft can pay off. 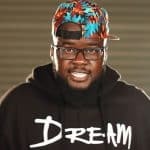 He was traveling as a Christian music artist, but back home one night when his wife asked him what his five year plan was. He didn’t have one and she wasn’t happy about it. Well, Beleaf got moving and worked with a good friend to come up with a 15 year plan. It involved speaking to men and boys about the importance of fatherhood in their lives and writing books on the topic. His mission is: equipping fathers, giving hope to mothers, inspiring children and he’s begun to fulfill his mission by creating a successful show and YouTube Channel called Beleaf in Fatherhood. As an entrepreneur, he is building a business that includes sponsorships and partnerships with Best Buy, Hello Fresh, and Windows. He is also expanding his impact and business by writing books and speaking to audiences of all ages about the importance and responsibility of fatherhood. Listen to hear how you could learn the hard work, discipline, and perseverance needed to build a creative business. Note, it’s not about the cameras you use or the lighting. It’s about the power of your mission and the dedication to your story. Please subscribe to the podcast and leave me a review and rating on iTunes. It helps the rankings and helps people find the show. I read them all and look forward to hearing from you.